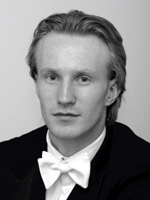 Rapidly establishing himself at the forefront of the new generation of countertenors, James Laing studied at Uppingham School and was a choral scholar at Trinity College, Cambridge. He furthered his studies at the Royal College of Music with Robin Blaze. He was selected by Opera Now as amongst Who’s Hot for his performance as Nerone Agrippina at the London Handel Festival. His broadcast work includes Sports Personality of the Year for BBC TV, In Tune for Radio 3 and Midweek for Radio 4. A feature interview appeared in the January/February 2007 edition of Opera. James Laing’s engagements have included Oberon A Midsummer Night’s Dream and Raphael Tobias and the Angel for ETO, Raphael Tobias and the Angel at the Young Vic and for the Oundle Festival, Refugee Flight for Glyndebourne Festival Opera, Nerone Agrippina and John Brockes Passion at the London Handel Festival, Medoro Orlando for the Early Opera Company Pastor L’Orfeo for Opera North, Zephyrus Apollo and Hyacinthus for OTC, Dublin, and the Classical Opera Company, the B Minor Mass with the City of London Sinfonia in St Albans Abbey, the St John Passion at Symphony Hall, Birmingham, Messiah with the Apollo Chamber Orchestra, the English Chamber Orchestra and the Hallé Orchestra, the William Byrd Festival with Pacific Northwest Viols in the USA, The Scarlatti Dynasty at the Blumental International Music Festival, Israel, and Other Shakespearean Dreamers at The Liceu, Barcelona. James Laing’s current engagements include Oberon A Midsummer Night’s Dream, Coachman/Fox The Adventures of Pinocchio and Spirit Dido and Aeneas for Opera North, Endimione La Calisto (Cover) for the Royal Opera, London, Giuliano Eliogabalo for Grange Park Opera, the St Matthew Passion in Ripon Cathedral, Messiah at the Royal Concert Hall, Nottingham, and Vivaldi Cantatas with the Ten Tors Orchestra.